The bottom of the Periodic Table is a murky place. It’s the home of elements with long, unfamiliar names; the domain of radioactivity and radiation. There are things down there which not even the furious furnaces of a supernova can make; things that only exist if you bombard other elements with subatomic particles. If the table were a medieval map, the bottom edge would be the bit marked ‘Here Be Dragons’. Yet one of the elements from this lesser-known atomic landscape has been attracting increasing attention from engineers, who believe it might be important to helping to solve one of our greatest problems — how to generate plentiful, clean, safe electricity. Thorium, element 90, is one of the most energy-dense materials known, but it currently has almost no industrial applications. Thorium is an alternative to uranium, which either fuels directly or is the basis for the fuel in every current nuclear reactor. Its proponents claim many advantages for thorium over uranium: greater safety margins, better safeguards against proliferation of nuclear weapons, shorter-lived waste products. But to get the best out of it would require a type of nuclear reactor which has never been built, and whose development was halted four decades ago. Sorting the hype from the reality about thorium is difficult. Should we invest large sums of money in a technology which has huge potential, but whose intricacies are as yet uninvestigated? It’s a question which the nuclear sector has found itself on the wrong side of before, as the difficulties of decommissioning the early reactors are only now becoming clear. Thorium is a relatively abundant element on Earth, about as common as lead. Naturally mildly radioactive, it’s been investigated as a nuclear fuel before, but lost out to uranium when the choices were made as to which fuel cycle to develop. The naturally occurring isotope of thorium cannot undergo nuclear fission. Bombarding it with neutrons turns it into a form which decays into a fissile isotope of uranium, U233. However, this does mean that all thorium is a potential nuclear fuel; only a small fraction of natural uranium, the minor isotope U235, is fissile. Moreover, starting with U233, rather than U235 as in conventional reactors, gives the fuel cycle interesting properties. Unlike uranium fuel, its use doesn’t generate transuranic elements, which remain dangerously radioactive for thousands of years. It also doesn’t produce plutonium, which has led to claims that thorium is ‘proliferation-resistant’. U233 can be used to make nuclear weapons, but when it’s generated from thorium, proponents say, it is contaminated with yet another uranium isotope, U232, which emits gamma rays that make it very hard to incorporate into a bomb. Thorium can be used in solid nuclear fuels, as an oxide or in a mixture of oxides (MOX), and this has been demonstrated in the past in several reactors around the world, such as the Dragon reactor at Winfrith in Dorset which shut down in 1976, and the Shippingport and Peach Bottom reactors in Pennsylvania. However, most proponents believe that thorium’s potential would be best realised in a different type of reactor. Rather than using solid fuel in rods or pins, this would use its fuel as a liquid, and is therefore known as a Liquid Thorium Fuelled Reactor (LFTR, usually pronounced ‘Lifter’). 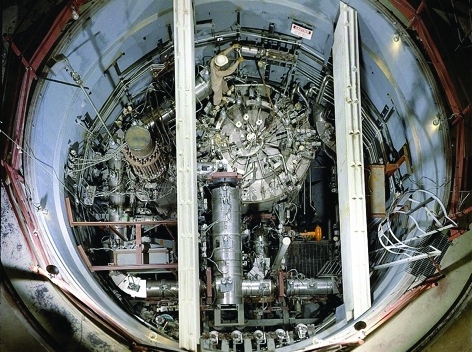 In this type of reactor, the fuel is dissolved in a molten salt, a mixture of lithium and beryllium fluorides called Flibe. Although no LFTRs have ever been built, the technology is based on another US experimental design, the Molten Salt Reactor (MSR) experiment, which ran from 1965 to 1969 at the Oak Ridge National Laboratory (ORNL) in Tennessee. Having the fuel in a liquid phase also means that it’s used more efficiently in the reactor. In solid fuels, only a small proportion of the fissile material in the fuel rod is consumed — or ‘burned’ — in the reactor, because atoms on the surface of the fuel rod absorb the neutrons which trigger fission first. But with the atoms circulating freely in a solution, every nucleus is equally available to absorb a neutron and 100 per cent of the fuel present can be burned. This means that for a given energy output, a liquid-fuelled reactor would be smaller than the corresponding solid-fuelled type. But do we need thorium at all, seeing as there is abundant uranium, and in the UK we’re proposing to build ten large uranium-fuelled PWRs which will have a design life in excess of 40 years? David Martin, deputy research director of the Weinberg Foundation, an organisation which promotes research into clean nuclear energy and has a particular interest in thorium, explained that the UK’s building programme could be part of a problem. In the absence of a working LFTR, however, all these advantages are only theoretical. While the Oak Ridge MSR proved that Flibe salt works and that energy can be generated from U233 in solution, it wasn’t a LFTR — it didn’t breed U233 from thorium and had no linkage to electricity generation. ‘You couldn’t even call it a prototype for nuclear power,’ said Hesketh. The type of LFTR that Kirk Sorensen is working on uses a two-fluid system. The energy-producing part is the core, consisting of U233 in molten Flibe salt contained within a graphite vessel. This is surrounded by a layer of thorium dissolved in the same carrier salt. Neutrons given off by the fission of the uranium go through the graphite, which slows them down, and are absorbed by the thorium. A chemical reprocessing system inside the reactor vessel separates out the resulting Th233, which is left to decay into U233. This is then returned to the reactor core, replacing material from the core which is periodically removed to strip out fission products. 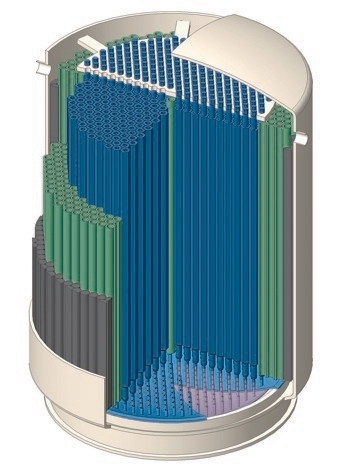 Core fuel also flows into a heat exchanger within the vessel, where it heats up another, separate circuit of molten salt; this is then used to raise steam outside the reactor to run electricity-generating turbines. The fission products produced by LFTR would be more radioactive than those produced by a standard reactor, but much shorter lived. ‘They decay away in about 300 years, and storing something safely for that long is an entirely different and much simpler problem than working out how to keep waste containing transuranics safe for 10,000-20,000 years,’ Sorensen said. Proliferation also remains a concern. A group of academics including Geoff Parks at Cambridge University and Robin Grimes of Imperial College published a paper in Nature last year warning that if the the decay element protactinium were removed from irradiated thorium, it would itself decay to pure U233 with no U232 contamination, and that could be used to make nuclear weapons. Indeed, Hesketh believes that even contaminated U233 could be used; the gamma radiation from U232 would be a problem, but not an insurmountable one, he said. In general, everyone agrees that LFTRs are a prospect for the future; Sorensen claims that, with sufficient funding, he could have LFTR power units ready for manufacture in factories by the end of the 2030s. But how much this would cost is uncertain. For Hesketh, the cost might be higher than the potential indicates. ‘It’s a far-off techology; there are major technical issues which have not been addressed,’ he said. Martin, meanwhile, sees things differently and has a UK-centred argument. ‘There’s a real risk that we’re going to lose our nuclear skills base in 5-10 years,’ he said. ‘To protect the nuclear industry, we need to be doing cutting-edge advanced R&D. I don’t think the government understands that you can’t just switch these R&D programmes on and off. If there’s a chance that we’ll need these reactors in 25-35 years time, we need to have a continuing R&D programme now.’ The target of LFTRs, with their inherent advantages, could prove an inspiring and tantalising large, long-term project to attract people into nuclear engineering and develop much-needed practical R&D skills, he added. Like much nuclear technology, the origins of LFTRs go back to the Cold War. 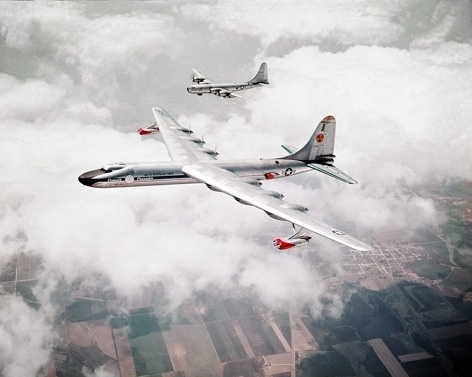 In this case, the spur for the development was an American plan for nuclear weapons to be carried in nuclear-powered aircraft that could stay in the air for weeks at a time. Rather than burning fuel to power jet engines, the idea was that an on-board nuclear reactor would heat air which would then be allowed to expand through turbines to propel the aircraft. 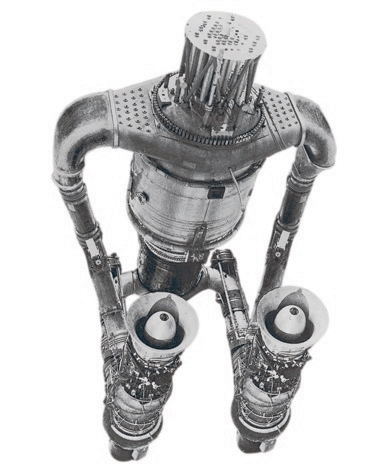 This required a very small, high-output reactor, and the liquid-fuelled reactor was developed for this purpose. Although two reactors were built, connected to engines and tested successfully on the ground, and an aircraft was flown with an operational reactor on-board in the 1950s, no nuclear-powered aircraft was ever built and the project was — perhaps thankfully — cancelled in 1961. Experience gained from this project went into Oak Ridge’s Molten Salt Reactor Experiment, led by Alvin Weinberg. Built in 1964, the MSR was an attempt to develop liquid-fuelled reactors with a view to using thorium as the fuel element. 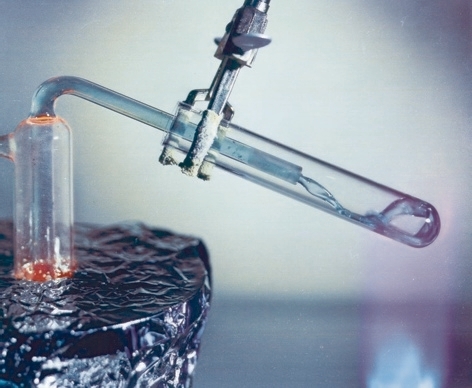 The reactor used Flibe salt as a solvent, and was constructed from the nickel alloy Hastelloy with a graphite vessel as the core of the reactor, but was not a breeder; it was fuelled directly from U233 produced from thorium outside the reactor. It was also not a power reactor, having no linkage to steam-raising equipment or a generating turbine. MSR ran in parallel to other experiments with fast-breeder reactors, which used U235 to produce plutonium. As the goal of the US at the time was to a large extent driven by the need to produce material for nuclear weapons, and as MSR could not produce plutonium, the project was terminated. 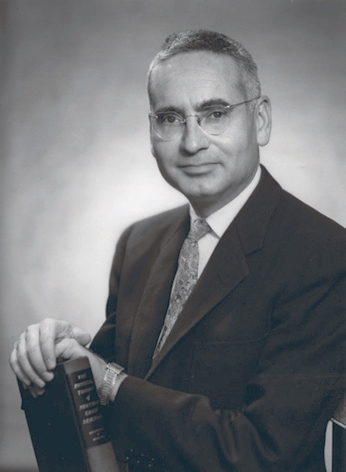 Weinberg remained a strong proponent of MSR technology and thorium, which became embarrassing to the Nixon administration; he was fired from his position as director of Oak Ridge, which he’d held for 18 years, in 1973. Negative emissions technologies — a positive step? Given the extremely high stakes of not reacting sufficiently rapidly to global warming, I’m concerned that the over all message of the article is in danger of relegating MSR technology to the realms of a long-term academic research programme. Its important to recognise that the key operating advantages and reliability of MSRs was established beyond any doubt by the Oak Ridge test results. An MSR “burner” design does not require the additional complexity of continuous fuel processing, and could be deployed in a much shorter timescale. I personally believe the world cannot afford to wait until the 2030’s for a grid-ready MSR implementation. Although on-line fuel processing, accelerator driven reactors and TWRs are nice to consider, I think energy policy makers and nuclear industry executives should acknowledge the massive advantages of burner MSRs, and to treat this as a critical path towards mitigating climate change. We cannot afford to dither about academic issues, we need to push forward with the already established successful elements of the Oak Ridge design without delay. At Hanford, another experimental MSR reactor was also constructed. It was called the Fast Flux Test Reactor (FFTF). There are several articles online about it. As a test reactor, the scientists essentially got creative, seeing what it could do. Several successes included the potential for creating a “breeder” that essentially created more fuel than it burned, and the ability to “burn” nuclear waste from other uranium based reactors – basically a nuclear environmental cleanup machine. Simply for that use alone, it may be worth considering building them aside the old production reactors as they near their end of life. So, which would you choose, 10-20,000 year storage requirements, or burn it and sweep the dust away? As a point of interest, I don’t think the NB-36 was ever intended to be nuclear powered. It was a modification of a B-36 to carry an active but one might say impotent nuclear reactor. It became the first aeroplane to carry a working reactor. The nuclear powered bomber concepts were a lot more exciting. Interestingly, the Russians had a similar programme. If anyone still doesn’t understand how dangerous and dirty any type of nuclear energy is, then please read the headlines on ENENEWS (dot) c o m immediately. I went to ENENEWS dot com as recommended by Anonymous. I was very concerned that a death has been reported recently in the nuclear industry and it hadn’t made the news. Oh, wait, the death was caused by an inflatable bouncy castle at the company picnic! The aircraft nuclear programme, of which ‘Fireball’ formed a part, hoped to develop aircraft with the capability to fly for extended hours whilst carrying the US’s nuclear deterrent. It was hampered by the technical difficulties of carrying the necessary shielding and cancelled due to the development of the ICBM. MSR and other variants such as LFTR (Liquid Fluoride Thorium Reactor) have great potential and can be made to be inherently safe. Breeder capability has been proved. The UK used DRAGON to experiment with more conventional 10 to 1 thorium to uranium fuel rods and ran it successfully for over two years. However if we are still debating the current technologies and costs I do not see how we will ever roll out the necessary programmes to develop Thorium and associated fuel cycles. ..so come on guys, lets have a serious discussion about the merits of this incredible technology (and please try to leave out the personal insults, this is the real deal and the subject deserved the very highest levels of respect). Taking the ‘science’ out of this discussion leads us to consider the impact of not developing such forms of power generation. Even ‘Conventional’, e.g. PWR Nuclear power generators has the potential of the UK, or other countries being ‘held to ransom’ by fuel suppliers. It seems to me the LTFR and similar Thorium powered reactors are free of this consideration. This alone should drive any expenditure necessary by all HMG’s to rapidly develop this technology as part of a concerted drive to make the UK independent of external fuel or power suppliers. We will never run out of thorium or uranium. Its important to remember that Molten Salt Reactors are the main attraction. Their greatly enhanced fuel economy means they can burn any combination of thorium, uranium, plutonium (including low-grade denatured 5% uranium for maximum proliferation resistance). Fuel supply security is not the issue here, the UK literally has sufficient nuclear “waste” alone to provide 100% of its electricity generation needs for the next 100 years, if burned efficiently in a Molten Salt Reactor. MSR start ups Terrestrial Energy and Transatomic Power are both pragmatic when it comes to fuel cycle considerations, the latter specifically targeting the incineration of nuclear waste as a means to produce abundant base-load generation. What’s also likely is that in 20 years, students of nuclear engineering will travel to China to study their MSR’s. The way things are poised now this is a certainty. no mention of there not being breeders for current uranium fuelled reactors. politicians and they are in the hands of the general public. It’s a decay product (Thallium-208) that emits the hard gammas. A) Th-233 decays in minutes, so it doesn’t hang around to absorb (waste) precious neutrons. B) Thorium only oxidizes up to +4, making ThF4, a liquid in the MSR. Pa can oxidize to +5, making gaseous PaF5. So separation is as straightforward as bubbling fluorine through the separator. Pa-233 can be removed before it wastes a neutron, and the ThF4 stays in the breeding solution where we want it. I agree it is the fluid fueled MSR that is important. The simplest, and easiest to get the design certified, including political, seems like the best path to me too. I support most of the design alternatives. However, I am not helpful because I don’t know how to overcome the funding and political hurdles. Whilst I completely agree with the opinion of David Martin regards increased R&D and equitable funding for both LFTR and renewables I believe it is essential to win the hearts and minds of the eco-green lobby right now. Many read ‘nuclear power’ as a byword for toxic and deadly and this ignorance must be confronted head on with a ‘green nuclear’ lobby. With the UK running perilously low in spare energy capacity in the next few years I dare say it will be the best time to ‘educate’ people as to thorium’s advantages when the lights go out. I’m in the US. Good article. I’ve been reading about the LFTR for the past few weeks and have been fascinated. I can’t find much wrong with it. Nothing is going to happen in the US with it. Our politics have gone horribly awry and our businesses are only interested in short term profit. England gave us the industrial revolution. Maybe, they can pick up the LFTR and run with it. Will the next Thomas Newcomen please come forward? Personally I find the technology fascinating, and from an engineering perspective I like the basic simplicity, especially when looking at the converter design promoted by Dr David Leblanc. With that design all the elements we have been designing for other industries for many years with no more complication from a high level viewpoint than having a container with a salt and graphite, and then a pump and heat exchanger external to it. I can’t see this being a technically challenging to design and build especially compared to the Fast reactors and gas reactors we developed in the 60’s and 70’s in quite short time scales. Such a design may not have the fantastic resource utilisation as the breeder designs, but it’s simplicity from both design development and R+D and regulatory perspective is compelling. I can only hope that our government will see the greater good in the molten salt reactor of low pressure anh higher heat transfer ability as safer and more efficent means of power generation with less wasted.Power to the U.S.for less cost!lets do this.